My typical negative stance on the "conversion story" doesn't only raise the ire of Roman Catholics, I've been in more than a few conversations with Protestant friends as well on this topic. I don't approve of conversion stories being used as apologetic tools, for the simple reason they are based on subjective experience. Someone else's experience is not the Gospel. God doesn't need the help of your "story" to evangelize. Often, if you boil down a "conversion story" it's simply a chance for a person to bring attention to themselves. People generally like talking about themselves (I include myself in this as well). I know one particular person who will launch into her "conversion story" at any minute, especially with a new acquaintance. In the worship service, I don't approve of someone bringing attention to themselves and their "story"- I don't really care about their story. I want Christ's story. Some people hold that at baptism, it's good for the person to tell their "story"- I disagree. Perhaps it's because I'm embarrassed at the sins I've committed against Christ. When I bring them up... it's like reminding the person you love how awful you've been against them. As to dramatic conversion stories, I believe that "dead in sin" is "dead in sin." Each person, before regeneration is equally dead in sin. God then raises a person to spiritual life. Some people aren't more "dead" than others because they were a worse sinner. This pops their "conversion story balloon." Suppose Christ called Lazarus to life from the tomb, along with another person who was a bit more sinful. Which person being called forth from the tomb has the more dramatic testimony? Neither! Both are equally miraculous. One serious problem with conversion stories that many people overlook is that while a person may claim the name of Christ as the end result of their dramatic story, this might not be the end of their story. Consider the radical Black Panther Eldridge Cleaver. After some time in prison, Mr. Cleaver had a dramatic conversion to Christianity. He then went on to check out the Moonies, and lastly ended up a Mormon. Or for those you old folks like me, remember in the late 1970's and early 1980's, Mike Warnke? Sure, he was a really funny Christian comedian. He was the ex-Satanic high priest turned Christian. He toured everywhere telling his dramatic story. Well, Cornerstone Magazine investigated him and tore his story to shreds. Or consider the recent Ergun Caner debacle. Here's one that hit close to home: a few years back I met a nice guy on the Internet through Dr. White's chat channel. If I recall, he had converted to Roman Catholicism, and was even interviewed by Marcus Grodi. When I met him in the chat channel, he would private message me often to talk about Roman Catholicism. He even sent me his 340 page book that documented his departure from Romanism and Orthodoxy back to being a Baptist. Well, he eventually went back to Orthodoxy. On a positive note, I have no problem with getting to know someone and hearing their "story". This is fine over a cup of coffee. But please, keep your "story" out of the spotlight. If you want to tell a "story"- tell Christ's story. In terms of using conversion stories as apologetic tools, Roman Catholicism is overrun with stories. If ever there was a group of people that like talking about themselves, it's Roman Catholic converts. I've earlier described these folks as theologians of glory. Their conversion stories are typically examples of achievement and glory. They in essence point to the abilities of a person and the supposed wisdom gained by crossing the Tiber. They do not point to Christ---they point to a triumphal entry into an allegedly magnificent human institution: the Roman Catholic Church. Their conversion stories are about what they did. They are about what wisdom and glory they achieved. This is not the foolishness of the cross. I assumed that when I posted CTC Conversion Stories comments and criticism would follow. One blog post was brought to my attention: Heads I win, Tails you lose. First, believe it or not, I'm grateful that someone took the time to read something I wrote and comment on it, even if I don't agree with the content of the response. That being said, I offer the following as a counter-response. 1. The Roman Catholic blogger states, "So let me get this straight: Reformed conversion story = helpful retelling of true events. Catholic conversion story = Manipulation." What I wrote above as an appetizer should suffice. The majority of what's written above is not new material, but rather taken from the archives of this blog. 2. The Roman Catholic blogger states, "This website [CTC] is the reason I am Catholic. Not the only reason of course, but without it, I would not have converted. It is to me what tolle lege was to Saint Augustine. It is a very successful website in achieving its goal of bringing unity to Christians." This proves my point in my aomin entry: CTC often uses the "story" as the vehicle to entice you to look across the Tiber. CTC is does not have the goal of unifying Christians. Their goal is for Reformed people to abandon sola scriptura and sola fide and join with a sect that no longer is a true Christian church. 3.The Roman Catholic blogger states, "James Swan critiqued my letter explaining my family's conversion to my PCA congregation. I found the critique something like a year later by chance, which makes me think I wasnt really his intended audience)." It is correct that many of my blog entries are not invitations to dialog and debate. Rather, your story was used to illustrate double standards and basic errors in theological epistemology for the readers of the aomin blog, so that people can be made aware of similar fallacies used by those, like yourself, that deny Christ and the church. 4. The Roman Catholic blogger states, "What I find weird is that Mr. Swan seems to view the same activity of... telling a story... as either helpful or manipulating depending on -not the way its told or the content- but on whether he agrees with what the character in the story did." The topic in question is "conversion" story, not simply, "story." Roman Catholic conversion stories, from my perspective, are not a positive movement of the Holy Spirit in a person's life, therefore, as Paul warns (Gal. 1:8), "But even if we, or an angel from heaven, should preach to you a gospel contrary to what we have preached to you, he is to be accursed!" 5. The Roman Catholic blogger states, "It seems to me that according to Mr. Swan, if I were to recount the religious conversions in my life, that my describing becoming pentecostal would be manipulative on my part, describing my conversion to the Reformed faith was not manipulative, then describing conversion to Catholicism would, again, be obvious manipulation on my part. Isn't this the definition of Ad Hominem argumentation?" As stated above, one of my primary concerns is with the conversion story being used as an apologetic tool. If you put your story on the Internet as proof of the truth of Romanism, it should come as no surprise that those who disagree with Romanism will challenge the facts you put forth as well as the alleged benefits of your story. 6. The Roman Catholic blogger states, "Huh? So when the dice roll for the Reformed they are fair, but when they don't they must be loaded?" The experiences described by Mr. Lim in question were put forth as table-setters for the truth of Rome and the alleged errors of Reformed theology. The experiences related by Mr. Lim do indeed have cogent Reformed answers, but in terms of "fairness" these were not mentioned by Mr. Lim. Rather, the hero waiting in the distance was the Roman church. 7. In response to my comment, that Mr. Lim's recollections attempt to provoke one to question the validity of their own experience, the Roman Catholic blogger states, "What is wrong with this? This is how I came to faith in Christ, and later, this is how I came to be Reformed. Part of it was people telling me stories that made me question my experiences. "Maybe those things I have done are really sins after all?" "Maybe I was wrong to think otherwise?" "Maybe I need a saviour after all?" "Perhaps that gnawing feeling in my heart is my yearning for a saviour!" These are all questions we want people to ask themselves... to challenge the validity of their own experience! I guess not James Swan though." This comment solidifies my point, and demonstrates a good reason why this particular person is now Roman Catholic. He appears to be saying he was challenged by the experiences of other people. I submit that a person like this is susceptible to be converted to almost anything. Rather, when he was a Reformed person, he should have been instructed to compare his experience to what the Word of God says, and conform his life to how God desires and instructs a Christian to live. 8. The Roman Catholic blogger states, "So the more times I empathize with a parable of Jesus am I being manipulated too? Or can a story be a way to help us relate to the truth?" Once again, my critic confuses "story" with "conversion story." Mr Lim presented his personal conversion story, not simply a story. The parables of Jesus are not personal conversion stories, they are the word of God, the ultimate standard of truth. 9.The Roman Catholic blogger states, "Sometimes a cigar is just a cigar Mr. Swan. People like conversion stories." Indeed, people do like to be entertained by a winning account of... almost anything. As I stated in my aomin entry: "For every Joshua Lim, there's someone "converting" to "something" somewhere out in the world. There's people that find the "fullness" of the truth in Orthodoxy as opposed to Romanism. There are people who become Muslims. There are people who become Mormons. They may even have compelling stories. They may even be former Roman Catholics. One of the ironies about conversion stories are those folks that continue having them. Take the ex-poster child for Catholic Answers, Gerry Matatics. He certainly loved to tell his story. Simply go back and listen to his debates with Dr. White. He'd tell that story every chance he could get. He'd even stay late into the night to tell it again and again. Now, go ask Karl Keating why Mr. Matatics is no longer endorsed by Catholic Answers. Similarly, how do I know that some of the current CTC stars aren't going to keep having a new conversion story? As Reformed people, if you want an infallible conversion account, you won't find such an item on the CTC blog, you'll find it in the pages of sacred Scripture." You see, David, you folks are using subjective experiences as evidence for the validity of a theological worldview. If your positive experience proves that Roman Catholicism is true, then any subjective positive experience can prove... just about anything. 10. The Roman Catholic blogger states, "And yes, being able to relate to someones thinking through a true life story of their experience is a great way to communicate. Is this really news? Think of the parable of the Good Samaritan. This story does exactly what you criticize! In this story we find Jesus is 'attempting to provoke you to question the validity of your own experience." Jesus uses a story to make us think about the question of "who is our neighbor". It is a very effective story! Was Jesus being "manipulative"? Is it true that "The more times you can empathize with [the Good Samaritan] story, the more you're being manipulated'?" Besides once again confusing a story with a conversion story, Mr. Meyer confuses the infallible Word of God with personal subjective Roman Catholic conversion stories. The Word of God is indeed the standard by which a person should be convicted of sin and exhorted to Godliness. A Roman Catholic conversion story is not such a standard. Those stories are to be scrutinized by an infallible standard. When they are, they fall quite short. They deny the sole infallible authority of the Scriptures and they promote a different Gospel. 11. The Roman Catholic blogger states, "If Reformed theology is true, James Swan has absolutly nothing to fear from these conversion stories." I don't recall anywhere stating I fear Roman Catholic conversion stories. Rather, my blog entries have simply pointed out the apologetic methodology being practiced by a many modern-day Roman Catholics. In this sense, it is no different than presenting materials on how Jehovah's Witnesses or Mormons proselytize. 12. The Roman Catholic blogger states, "Nobody is going to convert to Catholicism because they are jealous of someones story." But yet, we have your words above about how influential particular stories were in your own multiple conversions. Based on your words, it's within the realm of possibility that you were indeed jealous of their experiences and wanted what they had. This may be why you've had repeated significant paradigm shifts. You're seeking an experience someone else has had rather than seeking the infallible truth of the Scriptures. Now, you've had your own conversion experience, and advertise it so others can read it. Perhaps you fit the very description of the sort of person I described in the opening paragraph of this very blog post. 13. The Roman Catholic blogger states, "Have a bit of respect for peoples intelligence. Instead of accusing people at CTC of manipulation perhaps give them the benefit of the doubt that they are trying to help people. If, I repeat IF they are trying to help people... then they are not manipulating people." If the CTC folks have as their target audience Reformed people, and if they are presenting a different infallible authority and a different Gospel other than that described in the major Reformed confessions, then the CTC folks would not be "trying to help people." 15. The Roman Catholic blogger states, "Why does Mr. Swan have to resort to ad hominems though? Well if I wanted to throw one out there myself and try to get into his head like he seems to want to get into others heads... I would say he is secretly intrigued by these stories. Perhaps a bit insecure about his theology. Perhaps he wakes up at night in a cold sweat with the smell of incense in his nostrils and Gregorian chant in his ears... pope Benedict XVI beckoning him with that humble smile he has... holding out the Eucharist. Or perhaps that little story was trying to get too much into James' head and a bit over the line." As I've posited about your experience above, such a personal comment about me is fair game, and I'll take no offense. I'll simply just say that you are completely wrong. A few final points need to be made. I don't claim to be the clearest writer, or even a good writer. I do assume though that I'm clear enough that people will get the basic point. For the sake of Mr. Meyer, my recent aomin entry attempted to point out that ultimately Roman Catholic converts are entirely individualistic and subjective, all the while criticizing their former Protestant churches for being individualistic and subjective. They often criticize Protestants for having subjective interpretations of the Bible, while at the same time they have a subjective interpretation of Roman Catholicism. In fact, the very means by which Mr. Lim arrived in Rome were the individual and subjective opinions of fallible sources, as interpreted by... Joshua Lim. 4. 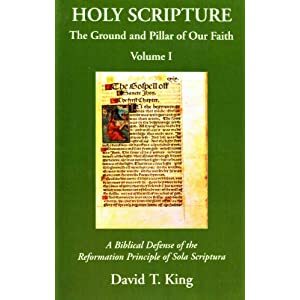 When the Roman Catholic apologist insists that the principle of Sola Scriptura has resulted in 25,000 denominations, we should in turn insist that the principle of Scripture plus an infallible interpreter has resulted in an even greater number of religious cults. Source: Eric Svendsen, , Upon This Slippery Rock: Countering Roman Claims to Authority [New York: Calvary Press, 2002] 65-66. If it's the same Lim story/confession I read the other day, my comment on Facebook was this: there was no clearly communicated gospel in any of it. He completely circumvented Luther in spite of all his supposed extensive reading, or any of the points Luther made. My conclusion was that the story is not real. It makes no sense. I am not sure that we should avoid our stories, as much as James says. Of course, some denominations have taken this to some levels that just seem so tacky, but we need to realize that God's word in our lives is living and active and new and we should have something fresh to say about it. Lately, I have made friends on Facebook with some very educated liberal people and professor of dialogue and dialectics. It's been pretty ruthless at times, but the distain for confessional material, which is regrettable is also nurtured by this "unreality" lack of art and sensitivity to life we may be displaying as "theologians" or "arm-chair-theologians." Yesterday I had a conversation with a member of the LDS. I gave what I though was a dry presentation of 1 Timothy 1:17 explaining how this concept of God is incompatible with LDS teaching. This conversation brought about tears of joy. And I come to realize that the line from the Athanasian creed, that jesus is inferior to the father as touching his humanity is essential for the gospel. It is a story that involves him, confessional material and scripture. We need to be able to bring these things together. And talking about 1 Tim. 1, Paul, there, also uses himself as an example of one who received mercy, showing forth the extreme patience of God. Anyhow, sorry James, just trying to balance things out. About Lim, though, I did not believe him. "...And talking about 1 Tim. 1, Paul, there, also uses himself as an example of one who received mercy, showing forth the extreme patience of God. ...". Hmmmmmm? From my point of view, that seems rather to dull not sharpen James' edge? When talking about the Apostle Paul we have several verses we can retreat into that might help sharpen the point being made; and you, being a Lutheran, know Luther was all for dulling glory to self and sharpening our senses so that in everything in, of or about our life and story, as Paul writes there at 1 Tim 1:17, we would always show forth God's Glory so others can see by our life and story God gets all the glory, kind of like what the Prophet John said when he answered the Jews about why more people were going over to Christ and His baptism and less to his. He said, "he" and "his" story must decrease! Here: Rom 16:17 I appeal to you, brothers, to watch out for those who cause divisions and create obstacles contrary to the doctrine that you have been taught; avoid them. Rom 16:18 For such persons do not serve our Lord Christ, but their own appetites, and by smooth talk and flattery they deceive the hearts of the naive. Rom 16:19 For your obedience is known to all, so that I rejoice over you, but I want you to be wise as to what is good and innocent as to what is evil. Here: Php 3:17 Brothers, join in imitating me, and keep your eyes on those who walk according to the example you have in us. Php 3:18 For many, of whom I have often told you and now tell you even with tears, walk as enemies of the cross of Christ. Php 3:19 Their end is destruction, their god is their belly, and they glory in their shame, with minds set on earthly things. Php 3:21 who will transform our lowly body to be like his glorious body, by the power that enables him even to subject all things to himself. I guess we can say the point James is making is the same the Apostle Paul makes when we reflect on Philippians 4:9 so that one keeps their ears wide open to hear and discern the story being told is glorifying to God or if it is not? If after telling my story, if the God of Peace is not present in it, it most likely was my own glory story not a powerful Gospel message bearing the Truth that conveys to the hearers the Faith once delivered to the Saints! I don't, in any way by these comments want to detract from your point either. My point is as we see from Paul's prophetic sense, we shall see a rise in self centered storytelling and less and less Gospel telling that cause the transmission of His Faith to the hearer. 2Ti 3:1 But understand this, that in the last days there will come times of difficulty. 2Ti 3:5 having the appearance of godliness, but denying its power. Avoid such people. I don't really object much to conversion stories. I do like the ending part of your post, though! When reading my comments, keep in mind, it's the idea of using conversion stories as an apologetic that troubles me, and as an aside, incorporating conversion stories into a liturgy (testimony time, as some churches do) also trouble me. As I said in my blog entry, I have no problem with getting to know someone and hearing their "story". This is fine over a cup of coffee. I likewise have a set of experiences that I'd willingly share with someone i was getting to know. I agree that there is a limited role in conversion stories and as a young evangelical, after awhile, I wished to hear preaching that was not centered around someone's "dramatic conversion." (Yeah, I too remember Warnke's stories and even then in the 70's I had to wonder if he couldn't be laying it on thick. I was so thankful for Cornerstone's excellent work in exposing him.) These dramatic stories often made others who had still valid but less dramatic conversions feel like second class citizens. And I agree it ultimately should be about Christ as the final end conclusion. But conversions stories are important, not necessarily as apologetic tools but stories to challenge our "plausability structures". These are sub-conscious constructs which develop over time and in life based on learning and experiences and get tucked away "back there somewhere." Dr. Francis Beckwith came up with this idea as it relates to conversion. Upon hearing a story of conversion from one faith to another, often our first reaction is that of doubt, disbelief, shock and even rage. However, our plausibility structure gets challenged and there goes the first chink in the armor. Do I expect people to hear my conversion story to Catholicism and convert because it's an apologetic for the Catholic faith? No, but I put it out there as a way to challenge their status quo of thinking based on their plausibility structure. Ultimately, I believe conversion results as the work of the Holy Spirit blowing wherever He wills, and one's heart being open to the message of the gospel. Conversion stories may just be a way that a person's heart and mind are first "chinked." I love to blog about them as a way to challenge people's plausibility structures. And, of course I want more people to consider the Catholic faith, it would be inconceivable to find what I believe is a great treasure and not attempt to share it somehow. These dramatic stories often made others who had still valid but less dramatic conversions feel like second class citizens. And I agree it ultimately should be about Christ as the final end conclusion. That's a great point, and one I've made over the years. Fortunately, in my Reformed church, gradual conversions are more the norm, as God has chosen to work with families- He adds to the church as children-are raised in the faith. I would argue that throughout history since the second generation of Christians, the norm for conversion is not the "dramatic" conversion story, but rather parents raising their children in the faith. But conversions stories are important, not necessarily as apologetic tools but stories to challenge our "plausability structures". In my opinion, this is just a fancy way of describing another apologetic tool. In fact, the rest of your comments are simply a description of using conversion stories as an apologetic. There has got to be a "right" or "better" way of handling stories. Today, I thought about Luther movies and biographies. In a way they are conversion story, also. BUT it matters not that Luther converted or had the tower revelation, etc., it matters what scripture has to say to us. It matters not how great or lowly we are, it matters only that God's mercy has brought us home. God cares about us and our stories, and so can we care about each other's stories. We need to rescue this sort of thing from the abuse we have seen. We need to rescue this sort of thing from the abuse we have seen. I'm glad you mentioned Luther. I realize his story has been told millions of times, but that is rather a historical account. Certainly people have used it as an apologetic. I don't have any problems with history being incorporated into apologetics, as long as it doesn't substitute for the Gospel. However, Luther himself told his conversion story so infrequently that there's a lot of ambiguity surrounding it. The biggest debate is the year. Scholars have quibbled over this for quite a long time, trying to determine if it happened before 1517 or after. Then there's the problem with Luther's recollections about this experience that he gave at the end of his life- that is, did he remember it all correctly? In regard to rescuing the conversion story from abuse, I realize that my position comes across as an extreme, and if someone were really out to get me, they could search through this blog and find inconsistencies with what I'm saying and with what I've written over the years. I have not been totally consistent. Yes, if I'm getting to know someone, part of knowing who they are is knowing about the grace of God in their life. But, we need to be careful that our conversion stories don't take the place of Christ's story. That's why i suggest people cease and desist using them as an apologetic tool. It's not even a consistent apologetic tool, as conversion stories appear across a number of religions. In Romanism, they are completely out of control with telling their own stories. I wonder if ex-Protestants turned Romanist learned the technique of using the story from their time in Protestantism? In the USA, telling the personal "born again" story is certainly embedded in the collective Protestant subconscious. In other words, using the conversion story is simply another way in which these new Romanists are still functionally Protestant. Luther's story isn't really a "conversion" story. He would say that the gospel was preserved in the church via the liturgical song, etc., as he learned in the village school in Mansfeld (Brecht). But our stories are many and we undergo events in which our faith is tested, changed, purified, helped, and so on, and these are good to share. So Luther, too, has a long story which contains many stories, and he was not too shy to refer to himself, quite often in a deprecatory way, just like St. Paul does--the least of the apostles. Your position does seem extreme to me. You have a good point but on the other hand a conversion story can be used to illustrate or explain something about the gospel. To the extent that is true (if it is true) that a conversion story can be used to illustrate or explain something about the gospel, a fake invented conversion story can also help illustrate or explain your point, and will work better since it's tailor-made. So a test is the question "is the fact that this is a real story, and my story, add anything to what I am trying to accomplish by telling it?" If so, I am doing something other than using the story to explain. I am drawing attention to myself and talking about myself, not the gospel. Which isn't necessarily bad, as you've said, it's part of getting to know a person.